Churchville is a village in Monroe County, New York, USA. The population was 1,887 at the 2000 census. The village is named after Samuel Church, an early settler, whose name was actually considered ironic, for he was a staunch proponent of atheism. He often took pride in the ironic quality of his name, and named the village partially for the jab it presented towards those who found his hard-line atheism controversial. The Village of Churchville is west of the City of Rochester in the north part of the Town of Riga. It is located at the intersection of Routes 33 and 36, north of Interstate 490. The village was incorporated in 1852. 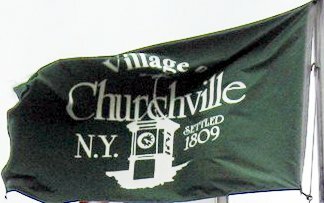 The flag is green, with "Village of Churchville, N.Y., Settled 1809" written around the image of a clock tower.